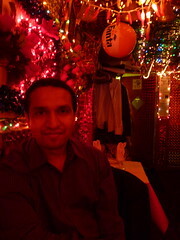 Milon and Panna II, East Village from Hannah Rubenstein on Vimeo. Hannah Rubenstein Boshir Khan, of Panna II, and Thahmina Ahmed, of Milon, are continuing a restaurant rivalry that has lasted more than 20 years. He will say no more for fear that his latest business innovation will be usurped by the enemy, Milon, a rival restaurant which shares the same building at First Avenue and Sixth Street. A silent, dazzling and well-chronicled war has raged between these two Indian eateries in the East Village for more than two decades. Now, a new generation of owners is preparing to take this battle for the hearts and stomachs of diners to a new level online. Any day now, Mr. Khan will launch a revamped website and he promises that its features will assure Panna II of its culinary supremacy once and for all. For now, though, Mr. Khan offers few details and each evening as the sun sets, the battle begins anew, bathing the sidewalk in a neon blaze. Milon and Panna II are mirror images of one another. They share many similarities: menus, BYOB policy, prices, décor—and a home. Flanking opposite sides of an iron staircase, each restaurant consists of one corridor-like dining room where tables and chairs form a labyrinthine obstacle course for waiters. 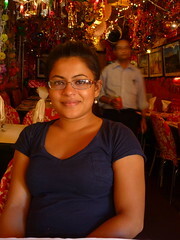 Bollywood music is pumped through the restaurants at a deafening volume. A disco ball hangs from the ceiling.